We are changing the way we communicate our business and sustainability performance. 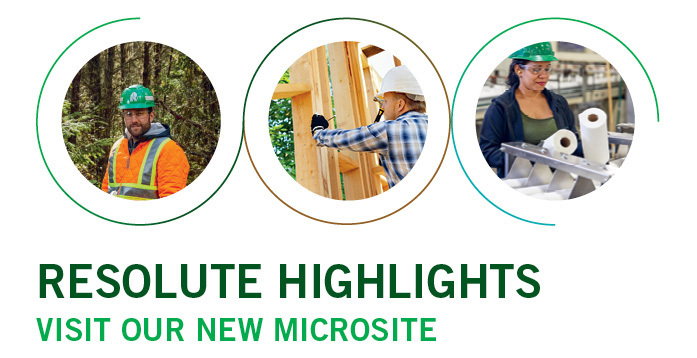 On April 10, we are launching Resolute Highlights, a new dedicated microsite that provides an overview of our strategy and business segments, as well as our sustainability commitments and performance. Now, at the touch of a menu button, site visitors can quickly gain access and insight into our company. All the key elements of our reporting remain, including a breakdown of our economic, environmental and social commitments and performance. Additionally, the microsite provides us with the technical flexibility to make updates related to our performance and site locations, and to respond to corporate developments in a timely manner. For those who wish to read printed material, there is an option to download and print a PDF version of the microsite, which becomes our company brochure. With this feature, we no longer require a traditional annual and sustainability report. A wrap was added to the 2018 Form 10-K to include the Letter from the Chairman and President and Chief Executive Officer, as well as corporate information. The Form 10-K is accessible on the corporate website. With the launch of Resolute Highlights, we are continuing to ensure best practices in business and sustainability reporting. We are also reinforcing our position as a sustainability leader by providing information that is more accessible to all of our stakeholders. To launch Resolute Highlights, go to www.resolutehighlights.com. The microsite is also accessible via the home page of our corporate website.